This volume represents a collection of topics presented at the Tenth Annual Symposium of the Barrow Neurological Institute. No attempt is made to be comprehensive but rather an attempt is made to give adequate attention to the major important topics in this field. Neuro- developmental biology, pathophysiology, and laboratory evaluation are discussed. Subjects include hypoxic ischemia, intraventricular hemorrhage, fetal neurosurgery, surgery of hydrocephalus, problems of apnea, ultrasound and CT imaging techniques, electrodiagnosis and ethical and economic issues. This volume will be of interest to neurologists and neurosurgeons in general, and especially to pediatric neurologists and neurosurgeons, and perinatologists. 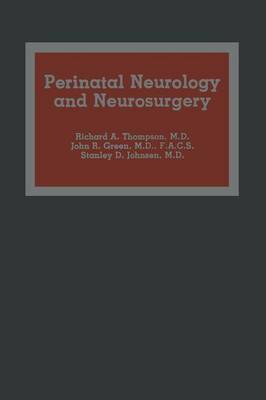 Richard A. Thompson, M. D. John R. Green, M. D. Stanley D. Johnsen, M. D. vii Contents Contributors v Preface vii Acknowledgments xi CHAPTER 1 Use of Fetal Neurosurgery for Experimental Studies of Structural and Functional Brain Development in Nonhuman Primates 1 Pasko Rakic and Patricia S. Goldman-Rakic CHAPTER 2 Pathogenesis of Perinatal Hypoxic-Ischemic Brain Damage 17 Robert C. Vannucci CHAPTER 3 Current Concepts of Pathophysiology of Perinatal Intraventricular Hemorrhage 41 Jan Goddard-Finegold CHAPTER 4 New Therapies for Asphyxia Neonatorum and Intraventricular Hemorrhage of the Premature 57 Gary W. Goldstein CHAPTER 5 Cranial Sonography and CT of the Infant 67 Diane S. Babcock ix x Contents CHAPTER 6 Cross-Sectional and Longitudinal Studies of Brain Stem Auditory-Evoked Potentials in High-Risk Infants 85 James J. Stockard, Janet E. Stockard, and Allen Merritt CHAPTER 7 Neurosurgery in Congenital Defects Other Than Hydrocephalus 111 Hector E.